The 3 basic components of plant food are Nitrogen, Phosphorus, and Potassium. 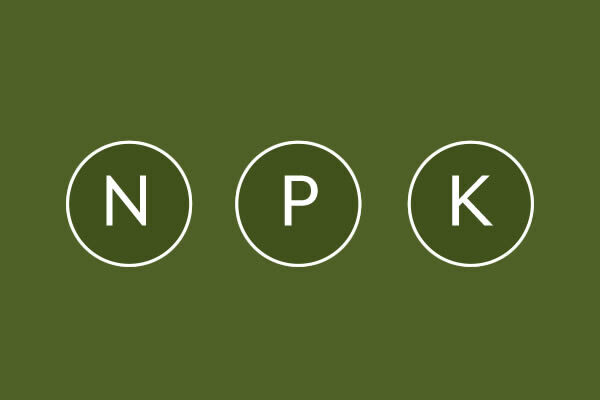 On all store-bought fertilizers, these 3 will be listed by the N-P-K ratios. Numerous other “trace elements” are blended with these. The compositions, strengths, frequencies of use, and seasonal timing provide yet more tempests-in-teapots for bonsaists to argue about. Historical perspective: The use of organics is a very long-standing tradition for bonsai, in large part because commercial chemical production is a fairly recent invention. Nearly all old bonsai books advocate a mixture of organics blended together into a kind of dough and placed as small “cakes” on the surface of the pots. One of my earliest duties as a bonsai apprentice was to mix cottonseed meal, blood meal, and bone meal together, using ordinary baking flour as a binder, into a doughy,”earlobe texture” blend, then rolling it into long sausages and slicing it into little pucks. I would let these dry, then put one puck into each corner of the bonsai pot. There were several problems with this method. Generally, the bone meal as sold in bags was not really very water soluble. As the little cakes melted away, the bone would just lie there. Also, the blood meal was irresistibly attractive to dogs, mice, rats, squirrels, etc. A larger dog would pull pots off shelves to get at it, and smaller dogs would tear into bags and root around in it. If the cakes became rehydrated in the pots, they would soon become fly breeders of epic proportion. The relative ease of fish emulsion was a tempting substitute, or at least an alternating regime, and was/is widely used. In recent years, commercial compositions have made huge inroads into the sacred organic methods. There are as many preferences as there are individuals. Some of us are high nitrogen advocates. Though this undoubtedly builds strength, it has several drawbacks. N encourages large, rank leaf growth, and long internodes (the length of the branch between leaves). As you veggie growers know, it will also hinder fruit and flower production. In Japan, it is also thought to make bonsai somewhat “course,” which essentially means lack of refined miniaturization on trunks and branches. Many of us have been going over to high phosphorus blends. The first real advocate for this in the early 70’s was Warren Hill, whom some of you have met. He wrote an article in the yearly California Bonsai Society magazine called ” Phosphorus—The Key to Life and Beauty,” that influenced a lot of us. High P has long been advocated as a Fall food because it strengthens roots for the dormancy period. The iconoclastic Hill wondered why it shouldn’t be used all year. Much voodoo surrounds the feeding process, which is far more straight-forward chemistry than we’d like to admit. The difference between the holy organics and Miracle Grow, etc. is probably not that significant. I have come to believe that seasonal timing is far more important than we realize here in the desert. Our growth cycles are heavily influenced by changes of light and temperature, and occur in a sort of punctuated equilibrium rather than in a slow, steady pace as in other climates. We get a dramatic, early spring flush, followed by a period of near dormancy during our hottest weather, then another flush as the trees anticipate fall. I noticed today that my elms have suddenly come back to fast growth now that coolness is in the air. My new method, therefore, is to hit everything pretty hard in early spring with my beloved Tiger Bloom (2-8-4), in 7 day intervals or even more frequently. Then, from June through July I back off and let the trees consolidate their gains. In late August, I start cranking the food again to anticipate the fall, pre-dormancy flush. Some of you even feed through dormancy in reduced amounts, and I’m liking that idea better all the time. Getting those nutrients available before the growth actually begins seems important, as if the tree were pulling strength together for its big spurt.